We love eating all the vegan food we can, but it’s good to learn how to cook for those who may have allergies or intolerances — and challenge ourselves in the process. Sometimes simplicity is where it’s at. Take these oatcakes, for example. Made with oat bran, quick oats, boiling water, vegan butter, and a little salt, they require no hard-to-find ingredients. Oat bran is one of my favorite alternatives to straight oatmeal, offering a more Cream of Wheat-like, porridge-y experience, but I hadn’t thought to bake with it until I found this recipe. Unfortunately, when I set out to actually make the oatcakes, I realized I didn’t have nearly enough oat bran! I could’ve made some impromptu oat flour, but I was feeling lazy and didn’t want to drag out the food processer or the Vitamix. So instead I just added in some quick oats like this recipe does. 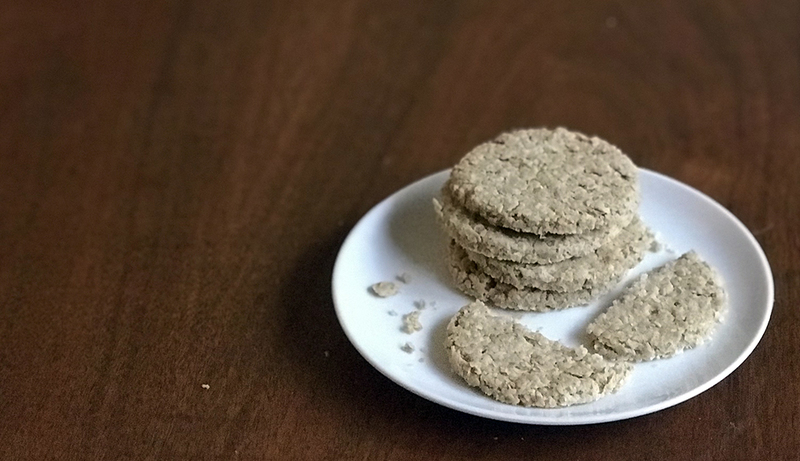 Even with this hodge-podge of a recipe, halved on the fly and cobbled together, I still managed to produce a small batch of crisp, gluten-free, fiber-rich crackers. Minimally flavored, they’re the perfect vessel for any topping: fruit jam, a smear of your favorite spreadable vegan cheese… you name it. Next time I make these, I’ll make sure I have ample oat bran on hand; these were a little bit crumbly, and I think the quick oats are to blame. Using 100% oat bran would probably help. What’s your favorite super-simple cracker? This post contains an affiliate link, which helps keep the lights on.